Dan Moberly takes the team to the site for a morning visit. The Mission is one of the most energetic, historic and richly layered neighborhoods in the world and the architecture of Vida reflects each of those facets. The fresh, contemporary design and caring craftsmanship are inspired by modern Latin culture – literally weaving the urban fabric of the Mission into the building itself. Vida benefits from being the block's tallest building and offers excellent light, space and views on all sides. From Bernal Heights to Twin Peaks to Downtown, you can enjoy crisp morning sunrises, dramatic sunsets and breathtaking nighttime scenes of San Francisco. Walk into any residence at Vida and you'll immediately notice the style that makes it special. From expansive windows, exposed concrete ceilings and columns and spacious balconies on many homes, no detail has been overlooked. 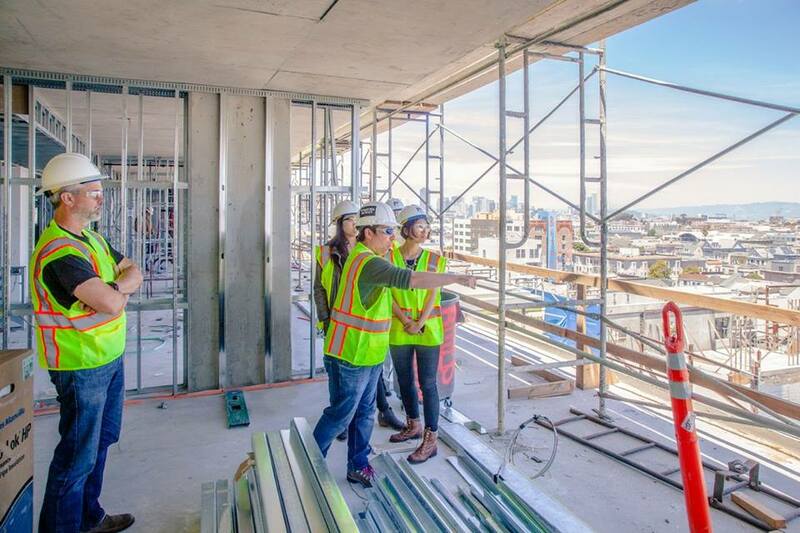 Up on the 7th floor you can walk out to a stunning roof deck with plenty of seating, a built-in dining table and barbecue and a view stretching from Downtown San Francisco to Sutro Tower. It's the perfect place to enjoy sun and host your guests.